Those who need transplants come in all shapes, sizes and backgrounds. Fortunately, hope does too when people register with Donate Life Texas. Organs and tissues are not matched with recipients according to race/ethnicity. In fact, people of different races frequently match one another. However, compatible blood type and tissue markers play a critical role in successful transplantation and are more likely to be found among members of the same ethnicity. The greater the diversity of donors, the greater potential there will be to make more transplants possible. For the most part, the range of race and ethnicity among donors reflects the same proportion as in the general population. However, the need for transplants is disproportionately high in some diverse communities, due largely to the prevalence of high blood pressure and diabetes, both of which can damage the kidneys and heart. In fact, according to the U.S. Department of Health and Human Services, African Americans, Asians and Pacific Islanders, and Hispanics/Latinos are three times more likely than Caucasians to suffer from end-stage kidney disease. 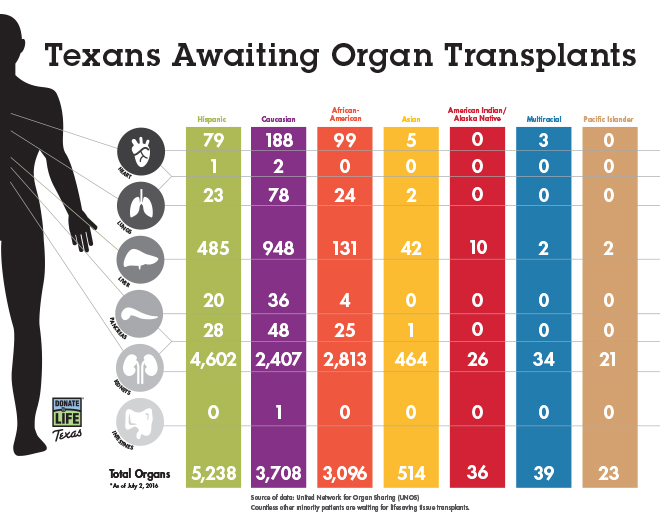 In Texas, more than 45 percent of the nearly 10,800 people on the transplant waiting list for a kidney are of Hispanic or Latino backgrounds. And, more than 25% are African American. If you have an idea for ways to reach your community, please tell us about it!